Darlings, it is quite simple to proffer elegance, sophistication, or even cosmopolitanism in one’s look or design du jour. Creating whimsy, on the other hand, can be a challenge; though it is obviously anything but for Madeleine “Maddie” Maciag of Petit Rococo. Each one of her delicate designs caters to romantic whimsy which transports you to a faraway land full of beauty, chatty kitty cats, and sweet-smelling flowers that fall daintily from trees. They are accessories that do not just accouter your form; but allow your mind to wander, as well. And now one (1) of you lucky ladies has the chance to take home one of Maddie’s charming creations. Café Fashionista has teamed up with Petit Rococo to bring one (1) of you fashionable femme fatales an enchanting pair of Bowtie Earrings (in the color of your choice) capable of casting a spell on you upon sight! ♥Visit Petit Rococo and choose your favorite piece. ♥For one (1) entry, leave a comment on this post between now and Friday, May 21, 2010 at midnight PST stating which Petit Rococo piece is your favorite and why. ♥For two (2) entries, Twitter about this giveaway, and leave a comment on this post stating which Petit Rococo piece is your favorite and why between now and Friday, May 21, 2010 at midnight PST with your Twitter URL. ♥For three (3) entries, become a follower of Café Fashionista on Blogger/Google Reader/Google Friend Connect/Twitter, and leave a comment on this post stating which Petit Rococo piece is your favorite and why between now and Friday, May 21, 2010 at midnight PST (if you are already a Café Fashionista follower, please say so in your comment). I will randomly pick one (1) name out of a hat (who knows, it could be yours! ), and announce the winner on Saturday, May 22, 2010. Winner will be able to choose the color they desire – Sapphire, Emerald, Ruby, Clear, Purple, or Peridot. Thanks to Petit Rococo for the pictures. aww those are soo pretty I love the pink ones! I am such a fan of pink and I want! :D and hehe some clothes are walmart ARE really cute I agree! Those earrings are soooo pretty!!!! hope I win!!! I'm also a follower on Blogger reader! I love the pink blossom necklace — so feminine and chic! Beautiful! Love the Louis necklace. Just trying my luck though. I love the purple earring by Petit Rococo! Purple has always been my favourite colour of all time. Next to pink, the colour inspire in me the princess-y feeling. Oh yes I am so a follower of Cafe Fashionista!! These are so beautiful! I need to wear more earrings. Pink blossom please! they are so pretty! I love the green ones!! Cute blog! Just found you via Susu Paris Chic. Became a Twitter follower, Facebook Fan and Google Follower. The purple Petit Rococo's are my favorite. They're sweet, stylish with a vintage edge. Love'em! Oops! So sorry, thought you said to follow on FB. Was about to, then realized you weren't on. Sorry! Wow, these are gorgeous! Thanks for such a great giveaway! 1) My favourite piece is the Charming Charms, such a quiant look. Gasp! And the Antoinette necklace is amazing! Those are sooo pretty! I love the emerald pair. lovely giveaway! i am a huge fan of the name of the shop! i love love love the pink champagne earrings. why? because they are springy, will go well with my new white top and new pink sandals. i also LOVE me some champagne! ok? lol. And I am a follower! xo, enjoy your weekend! I love the Louis necklace... so fabulous. The purple ones are caaaaute! what an amazing giveaway! the pink ones, definitely! Oh my gosh.. these are handmade? I like the fan-tastic fan earrings. So cute! Awesome giveaway, Erik! I think my favorite thing on the website is the Antoinette necklace. But everything is gorgeous! Have a wonderful weekend. Wow, this is all gorgeous. I really like the bowtie necklace! Here's another vote for the Louis Necklace - actually the whole set is cute! She's really talented! These earrings are SO beautiful. Sadly I'll have to pass on this giveaway as I don't have pierced ears! these are so cute! the peridot (green) ones are my favourites, but they're all just adorable! Great giveaway! I love the Louis necklace. cute earrings! randomly found ur blog and was really nice browsing through! The icy lilac necklace is gorgeous! It's so dramatic yet I could see it wearing it with everything from casual to cocktail! I follow on Google Reader and RT@prblms4loki! Thanks! Enter me please!!! 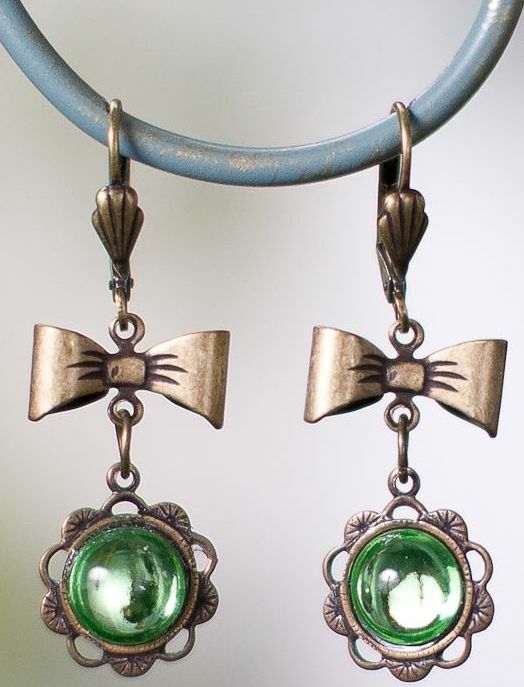 If I win, I would choose Peridot Bowtie Earrings because it's the colour that I love! I'm a new follower from Spain! My favorite are the Moroccan Rounds earrings. So pretty!!! Ohhhh, these are the cutest earrings!! I love the Pink Blossom necklace on the website as well. It's so romantic and summer-y. My favourite piece is the sapphire peridot earrings, because I like deep blues. These are just beautiful! Wow, great earrings! Those are so cute!!! I like both colors! So cute!!! I love both colors! love the femininity of both! these are very sweet. i like the louis necklace, from the collection; it's so thick and luxurious. you really wouldn't need to wear anything more complex than a white t-shirt with it, which is lovely in a good jewellery piece, you know? thx..so do you wanna exchange link and or follow me? ?if you dont mind..
Great giveaway, I love both colors! My favorite piece is the Paradise necklace. It is so bright and colorful! I love the double strands too. should I leave my email? Love the emerald ones or the purple. Those bowtie earrings are so cute! They'd be great to wear to an afternoon tea party. I like the Antoinette necklace, too. Hi, Erika! Wonderful giveaway as always! I'm in love with the antoinette necklace because that baby could MAKE an outfit. I agree with Embodying Fashion. The pink champagne ones totally rock. I am a follower and this is the cutest giveaway ever! I like the pearl romance earrings :) and I'm a follower of course! These are stunning. I wish I had my ears pierced so I could enter!!! oh wow, it was totally hard to pick a favorite! but i really love the Pearl Drop earrings! these are just gorgeous- whoever wins is one lucky lady! My favorite would be the clear ones! She is very talented and I love her earrings! Love Charming Charms because .... because they are just soooo cute!!!! Love the intricate detailing on the Moroccan Rounds earrings! As I read the tweet about the Giveaway I went immediately to your site and was not disappointed. 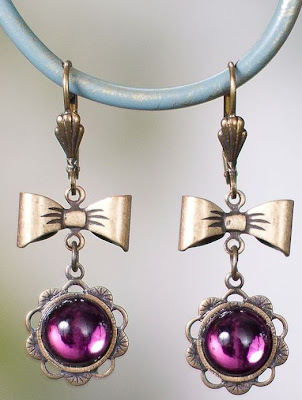 The Bowtie earrings are amazing, like especially the purple ones. I also like the Pearl Romance Earrings very much! I love following Cafe Fashionista,and I love bows.I love the earrings in this post because of the era they seem to embrace.A mix of tea party elegance and Alice in Wonderland , these earrings embrace the 1800's as if they're truley that old! I love anything whimsical , and these are avante garde and whimsical at the same time!